“Have you heard this one? The funny bone can be a fickle thing. Writing jokes is hard work. But if you have a gift for humor, your marketing campaigns will be better. Why? "Laughter is a universal language and one of our first communication methods," writes Angie Pascale of ClickZ. "Before we had spoken or written language, humans used laughter to express our enjoyment or accession with a certain situation." I'm sure you've noticed that funny memes and witty hashtags are popular. Most viral content is funny. There is even study to prove it. Its results state that "humor was employed at near unanimous levels for all viral advertisements. Consequently, this study identified humor as the universal appeal for making content viral." So, brand benefit one: Funny content gets shared more on social media. But what else does humor get you as social media marketer? An elderly grandma is on her death bed. She leans over to her granddaughter, knowing that death must be close, and says, "I want to leave you my farm. That includes the villa, the tractor and other equipment, the farmhouse and $22,398,750.78 in cash." The granddaughter, about to become rich, says, "Oh Grandma you are so generous. I didn't even know you had a farm. Where is it?" With her last breath, she whispered, "Facebook." One of the most effective ways to market is to evoke emotion. People feel good when they are laughing. It releases endorphins, relaxes the body, boosts the immune system and helps to relieve stress. If you want your customers to associate good feelings with your brand, make 'em laugh. According to Pascale, research shows that just 42% of positive experiences are forgotten, while 60% of negative experiences fade from memory. Think about what TV ads you remember. You don't remember stuff that is dull, certainly. The funny ones, right? Little kid Darth Vader? The one where the wind is personified and everyone hates him? "Laughter is social," writes Pascale. People laugh 30 times more when they are with other people than when alone, according to Professor Robert R. Provine of the University of Maryland Baltimore County. "Laughter eases tension and forms a sense of unity through groups," writes Pascale. 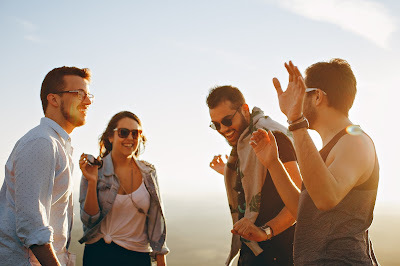 "Get your Facebook fans or Twitter followers laughing, and you'll be helping to establish a sense of community and building connections with your brand and amongst your fans and followers." What is humor exactly? Why are some things funny? Peter McGraw, director of the Humor Research Lab and author of the Humor Code, says that "funny" is the intersection of benign and violation. If something is benign, it's not going to be funny. Washing the dishes. Setting your alarm clock. Rabbits. Boring and benign. If something is a violation, it's also not going to be funny. An insult. A scary point of view on the world. "But that sweet spot between everyday and offensive, that's where funny happens," writes Pascale. Setting your alarm clock for insults. Rabbits with a scary point of view on the world. Funny?